Fair skin is becoming an obsession nowadays that even men are increasingly using skin whitening creams and other products. However, this craze may, unknowingly, come with a hefty price tag. 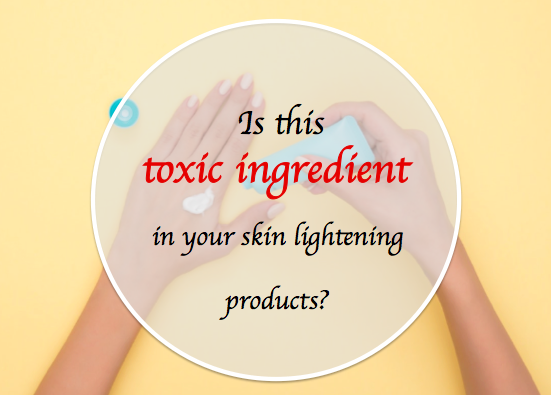 Products that are marketed as skin lightening, such as skin creams, antiseptic soaps, and lotions, often contain dangerous ingredients such as mercury and hydroquinone. Anti-aging creams that help remove age spots, freckles, blemishes and wrinkles are not an exempt. Why is mercury used in cosmetics? Despite being one of the most toxic heavy metals on earth, mercury was found to inhibit the production of melanin, the pigment responsible for giving skin its dark color, which prompted manufacturers to use it in their skin whitening products. According to the Word Health Organization, there are two forms of mercury that are used in the cosmetics industry. Inorganic mercury, which is used in soaps and skin whitening creams; and organic mercury which is used as a preservative in eye makeup cleansing products and mascara. The use of products which contain mercury may lead to mercury deposits in vital organs such as the kidneys, liver and brain. In a study published in 2005, female mice that were treated with a skin whitening product for one month showed noticeable changes within their kidney tissues, as well as their liver and brain (1). Another study showed that African women who used skin whitening creams for periods ranging from one month to three years had high incidences of nephrotic disease, which is a type of kidney disease. Furthermore, over three quarters of those who stopped using the creams went into remission (2). Pregnant and nursing women using skin whitening products not only risk their own health but that of their babies as well since mercury was shown to pass into breastmilk (3). Other symptoms of mercury toxicity may include numbness and tingling in hands, feet or around the mouth, hypertension, elevated blood sugar, depression, irritability, shyness, as well as changes in vision or hearing. Next time you buy a whitening product or anti-aging cream look for the following words on the ingredients list, mercurous, calomel, mercuric or mercurio. If you find any of them return the package to its place and run away (literally)! - Niacinamide or vitamin B3: Niacinamide has the ability to reduce skin hyperpigmentation, as well as significantly improve the appearance of aging and photodamaged skin. In a study, Japanese women who were treated for eight weeks with a vehicle containing 5% niacinamide showed significant reduction in their facial spots (4). - Vitamin C: Ascorbic acid or vitamin C is known for its ability to protect the skin from UV damage and stimulate the production of collagen. Adding vitamin E to increases the efficacy of vitamin C four fold (5). However, vitamin C serums should only be applied at NIGHT. - Indian gooseberry (Amla): In one study to compare the efficacy of amla extract and hydroquinone, another toxic chemical that is often added to whitening and anti-aging products, in reducing upper arm hyperpigmentation found that amla was as equally effective as hydroquinone, without the adverse side effects.